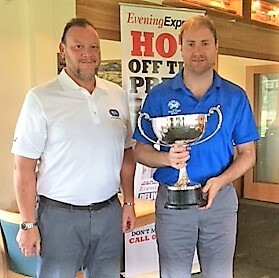 Portlethen amateur Clark Brechin has finally got his hands on the Evening Evening Champion of Champions scratch trophy after losing two previous finals. Clark defeated Billy Main, of Meldrum House, by 3 and 2 at Peterculter. Clark said: “Having lost in two previous finals, defeat wasn't an option this time. “I've put in an incredible amount of work on my game recently and I'm so glad to see it finally pay off. “I played excellent golf for the first six holes and could've been more than 2up but Billy played pretty solid around the middle part of the round to keep the match tight. “Luckily I managed to just keep my nose in front throughout and after the par 3 on 15 which put me 2up I was confident I would close out the match. Clark won the first with a conceded birdie after Billy fired his opening shot left out of bounds. Billy hit back to square the match by holing a slippery 15-footer for birdie at the second. However. Chris restored his lead by matching Billy’s effort for a birdie two at the third. Billy found trouble off the tee at the fourth before conceding another birdie win to Clark ahead of the pair matching birdie fours at the fifth. The sixth was also halved before Billy pulled a hole back with a par at the seventh. The next four holes were halved in pars as Clark took a one-hole lead on to the 12th tee. Billy’s ball lipped out of the cup for par at the 12th as Clark restored his two-hole advantage. The door looked open for Billy to get one back after Clark raced his downhill attempt for birdie 15ft past the cup. But Clark slammed it shut again by confidently holing out. Billy did pull one back at the 14th after Clark’s tee shot found deep rough high right of the fairway. 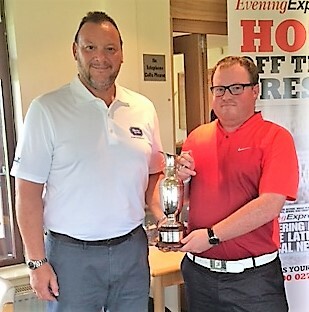 However, after errant tee-shots at the next two shots, Billy conceded defeat ending any hopes of repeating his victory in the tournament 25 years ago when he defeated Steven Young, of Inverallochy, at Westhill. Meanwhile, Chris Kelman, of Deeside, lifted the handicap trophy after Neil Bremner, of Kintore, was unable to play due to work commitments.